Tigers & Strawberries » Can Urban Farming Help Alleviate A Looming Food Crisis? Americans need to go back to the land. I don’t mean this in a 1960’s, leaving the city for a commune in the country, complete with goat milk, wheat grass and sprouted lentil loaves, kind of way. I think we all need to get back to the land wherever we are. 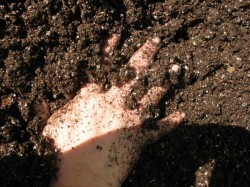 We need to touch whatever bit of earth we have at our disposal, whether that means a planter on the deck, a grassy front yard, or an empty lot at the end of the block. We need to do more than touch that earth–we need to till it, plant seeds, tend them and watch them grow into food for ourselves, our families and our neighbors. America used to be a nation of farmers, and we need to remember that and return to our roots. Because of rising food prices, and looming threats of food shortages. Because of lack of availability of fresh vegetables and fruits among the urban poor. Because of soaring obesity rates, and lowered nutrition among the country’s poor. Because eating locally is good for us and the environment, and our local economy. And because we need to remember who we are, as a nation. Gandhi once said, “To forget how to dig the earth and to tend the soil is to forget ourselves,” and he is right. As Americans have turned away from the land, as we have allowed farms to be turned into strip malls and condominiums, as we have turned away from self-reliance and embraced consumerism as a lifestyle, we have forgotten the soul of our nation. We have forgotten what once made us strong, and that was a deep connection to the earth, to our homes, to our neighbors. We need to rebuild that connection, and in doing so, we will be better able to weather the coming economic recession, high food prices and possible food shortages which loom over our future lives. And the thing is–gardening and growing at least some of our vegetables and fruits–can be accomplished anywhere. You don’t have to have forty acres and a mule, or even one acre and a rototiller. A small urban yard will do, or a series of containers on a rooftop or balcony or a vacant lot. 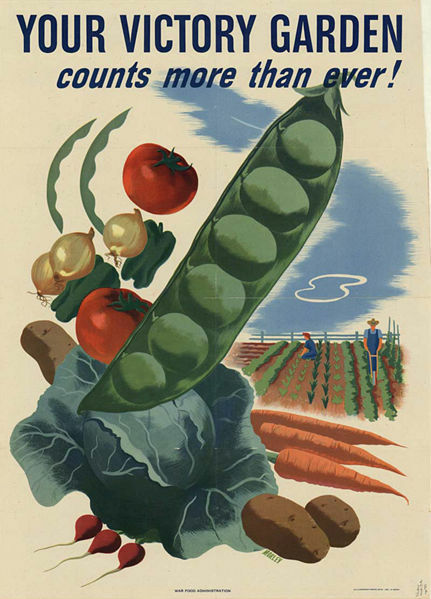 Urban agriculture is finally coming back into its own in the US, after last being seen as a real movement during WWII with the “Victory Garden” campaign when rooftops and backyards were planted in cities and larger gardens were dug in the country by people from all walks of life. The New York Times features an article on the growing trend of urban farming in the US where individuals not only grow food for their families on vacant lots, but also grow enough vegetables to sell to their neighbors. Not only does this bring in extra cash for people in poor neighborhoods, it also brings much appreciated fresh food to people who have little choice in where to shop. The Times reports that co-ops have been formed, CSA;s have gone urban and restaurants have taken to buying produce grown within their own cities. For proof that city-based agricultural ventures, from backyard gardens to community gardens to full-fledged urban market farms, can produce a significant amount of food in modern times, we need to look beyond the US, however. We need to examine the current urban agricultural system of Cuba. Cuba’s successful experiment in urban agriculture started as a means to feed Cuba without relying on food imports after trade embargoes caused food shortages. Currently, urban farms occupy around 86,000 acres, and in the past few years, these farms have produced 3.4 million tons of food annually. Urban farms grow 90 percent of the fresh vegetables for the city of Havana alone. Considering that these government-led and supported urban agriculture programs only started a few decades ago, their success is astonishing, and to me, enticing. Just think of what Americans could do with our abundance of land, in comparison to the smaller acreage available to Cuba. Why don’t we do it then? Why don’t we all start planting our own “Victory Gardens” again, and take the time to learn how to grow our own food, and take back a measure of self-reliance once more? Why don’t we claim our own victories–against poverty, against processed foods, against corporate control, against our own complacency–and relearn what we have forgotten: how to dig the earth and tend the soil. Let’s join other Americans and do it, in big ways and small ways. Author’s Note: Our backyard is finally being terraced this year, and the first things we will plant in it will be asparagus crowns, strawberries and a bunch of annual vegetables. The ornamentals–the flowers and shrubs, and hopefully fruit trees–will wait for next year. The food comes first. Barbara, thanks for adding your voice to the rallying cry. Momentum is growing, and I can personally feel the tug to return to the garden increasing. No roof or patio access at my current L.A. apartment, but I keep dreaming of going home to Ohio. Oh wow, I wish I could garden! I live in downtown Toronto and we have way too many raccoons. Anything I’ve tried to grow has been eaten (usually one bite out of just pre-ripe food) before I can. Hanging baskets, nothing is safe. It bugs me because I DO want to grow my own food, but I refuse to encourage or feed raccoons, as there’re enough of them that they are increasingly bold and aggressive. I am swooning over the building in Germany (I think?) which is built so that its sides are a vertical garden. Can you imagine? A city of skyscrapers where the sides of the building alternate solar panels and amber waves of grain! I am known for having a black thumb, but with the rising costs, I feel drawn to find a way to make growing food at home work. I think growing food at home is absolutely essential right now. We need to get back to the land and get our fingers dirty . . . only then can we respect our land again and find our way out of this mess . . . Thanks Barbara, this is a great article. I’ve been practicing as an urban farmer in a small way (only about 200 sq ft of garden area) for a few years now. It has a small effect, but I love the results. Fresh tomatoes, other veggies. I completely agree; most people can find space to make a small amount of gardening work. A container, anything. It’s wonderful. I picked up “O” magazine while traveling last month, and read a GREAT article in there about urban farming in Detroit. It was inspirational and covered the issue very broadly. Everything from demo/neighborhood gardens, to feisty old ladies farming vacant lots and their back yards. It got me excited to try to do a bit more this year. My yard is very shady, but I am going to try to find a few feet for some tomatoes this year. Yes! It is so rewarding too! When I lived in an apartment I got permission from the landlord to cultivate a small corner of the communal lawn. I had so many tomatoes, I shared them with neighbours. It was great. Now I have a house, and much more space to grow stuff. Sadly, I don’t really know any of my neighbours. Perhaps it would be a good way to get to know folks – going door to door this summer with my surplus tomatoes for free. examines Cuba’s response to the food crisis created by the collapse of the Soviet Bloc in 1989. At one time Cuba’s agrarian culture was as conventional as the rest of the world. It experienced its first “Green Revolution” when Russia was supplying Cuba with chemical and mechanical “inputs.” However, the collapse of the Soviet Union in 1989 ended all of that, and almost overnight threw Cuba’s whole economic system into crisis. Factories closed, food supplies plummeted. Within a year the country had lost over 80% of its foreign trade. With the loss of their export markets and the foreign exchange to pay for imports, Cuba was unable to feed its population and the country was thrown into a crisis. The average daily caloric intake of Cubans dropped by a third. Without fertilizer and pesticides, Cubans turned to organic methods. Without fuel and machinery parts, Cubans turned to oxen. Without fuel to transport food, Cubans started to grow food in the cities where it is consumed. Urban gardens were established in vacant lots, school playgrounds, patios and back yards. As a result Cuba created the largest program in sustainable agriculture ever undertaken. By 1999 Cuba’s agricultural production had recovered and in some cases reached historic levels. Havana, at least as shown in this documentary, looks like a really nice city to live in. More greenery, more community, more self-reliance. Fewer cars, less pollution, more people walking and riding bikes. My attempts at home gardening have given me a greater appreciation of farmers. The first two summers we lived in this house, I tried to grow tomatoes and a few herbs; alas, the summers in question happened to be record hot ones; I got no tomatoes and only a little bit of basil and parsley. We’re attempting gardening again for the first time in several years (a couple watermelon hills), but I’m not holding my breath that we’ll actually get any results. Between unpredictable weather, soil that’s been sod and weeds for at least ten years, day jobs, a mentally disabled child who’s obsessed with shredding plants (if we ever grow onions, they’ll have to be behind a six-foot brick wall to get any results), fire ants and other local wildlife…. Add in what we’d have to spend on soil amendments and seeds, and the farmer’s market and CSA are a bargain ;-). It drives me nuts how suburbanites all seem to feel the need to lay claim to their little patch of grass, and then they don’t even do anything in particular with it. So very, very wasteful. But my preferred solution would be for all the non-farmers to move to higher-density housing, and leave the farming to the people who know what they’re doing. I see no particular reason why everyone should be involved in farming, if some are better at it and more interested in it than others. Division of labor is a good thing. But since nobody’s going to raze the suburbs and put in high-rises any time soon, sub/urban farming is good too. So…for someone who wants to get started in backyard gardening but has no idea what they’re doing, what do you recommend? I live in Portland Oregon. There are many gardens here and many people who buy CSA’s and local produce. I have seen a few urban farmers who could not get land, rent themselves out and farm peopls yards for them. I think that is a great idea. I do not have a garden so I go to the u-pick farms close to town in the summer and freeze a bunch of stuff. Thanks for the inspiring thoughts. I want to go garden now. I love seeing your recipes over on food_porn, and recently started reading your blog more regularly. I just had to comment on this entry because I agree so much. I’m going to school in the middle of what is now Silicon valley. When my father lived here as a child in the 1950s, everything was apricot and plum orchards- under all the concrete and strip malls is fantastically fertile soil. It breaks my heart to think about what we’ve lost in the way of farmland. I can’t garden at the moment because I’m in the dorms, but I have taken to planting my family’s garden when I go home for spring break. By the time I’m home for summer everything is starting to be edible! This next year I’ll be renting a house, and I’m already planning on starting some kind of container garden. Fresh food is just so wondeful. I had no idea that this idea was gaining a foothold in homes all over the country. I’m looking forward to reading those articles you’ve linked to (although your last link is invalid?) and finding out more. Any of your readers interested in trying container gardening would probably love the book “McGee and Stuckey’s Bountiful Container,” I certainly do. I’m hoping to get more adventurous next year with the existing soil, rather than relying so much on the containers and beds. We’ll see! Here in SF some people tried growing an urban garden on an abandoned lot. They were tired of the mess, the beer cans and those who had turned this lot into a garbage dump. Once the owner found out, she had the garden ripped out — even though the group would have paid for the water, she refused to let them use the land. The last I looked it was back to being urban blight. Unfortunately, not every attempt at growing a garden has a happy ending. Julie, thanks for the link to garden girl – looks like a cool site. I grew up in Iowa with rich soil and 2 large family gardens. I’ve lived in Georgia quite awhile now, and get frustrated with the hard packed clay here. I finally built my first raised bed a couple of years ago, and am excited to see what this year will bring. For those just starting out, I recommend several things. 1. Start small – a success with a few tomato plants and some basil one year will motivate you! 5. Check out your local library! Is there a subject out there that can be addressed without Debbie Downers (wa-WAH!) showing up and saying it’s impossible? So frustrating. Why the need to bring negativity to every subject on the planet? I’ve no access to a garden plot, patio, or even window sill, but my kitchen has completely gone to pot…literally! There is a container garden on my kitchen floor and counters. I started with herbs, now I have pepper, onion, and tomato seeds that I’m waiting on to pop up. The potatoes are going bananas! As a shut in, I shop only once a month. This garden will help with the fresh food. Hi there, this is exactly what I am doing! I couldn’t be happier…I have a half an acre boutique farm where I sell some produce to local folks and some to my “Produce Partners” at the Little Red Bike Cafe. I’ve always had in mind that when I eventually open my own restaurant I’ll have my own market garden in the grounds, like Midsummer House and Le Manoir aux Quat’ Saisons. Meanwhile, seeing your poster, I thought you might be interested in this post I wrote a year ago about the Dig For Victory campaign. Its interesting that you mention rising food prices as Michael Pollan and Alice Waters gleefully celebrated these rising food prices, where the ends justify the means(NY Times; April 02, 2008). In their eyes, skyrocketing increases in food prices is acceptable if we see stuff like this- a return to urban farming by some people. But at the same time, Alice Waters never acknowledges the harsh reality of a return to an artisinal agriculture would bring starvation to millions of people across the globe. One has to look in the mirror, and face the truth that without these multi-national corporations, millions more would be probably be dead from starvation. Also, I just wanted to add that its not necessarily better for the environment to eat local. The peer-reviewed scientific research has shattered that myth when they examined the overall carbon footprint. In some cases, it was actually better for the environment to grow something thousands of miles away, and ship it rather than to grow it local. There may be plenty of reasons to eat local, as you’ve outlined, but environmentalism is not necessarily one of those reasons. dana: It’s true that “Local is always better for the environment” is a myth. That doesn’t mean that local is never better for the environment. To my knowledge, examples of local food being the worse choice for the environment tend to be of one of two kinds: (1) shelf-stable (canned or dried) products that can be transported by ship without spoiling, and (2) fresh produce grown out of season in climate-controlled hothouses. As far as I know, it’s not a myth at all that local, seasonal fresh produce is generally better for the environment than non-local or non-seasonal fresh produce. But I’ve been wrong before, so if you’re aware of peer-reviewed research to the contrary, I’d be really curious to see it. There is farming operation called Coastal Field Farms (currently located outside of Kiowa, Colorado) that got its start by leasing unused backyards in the Lakewood & Arvada areas of metro Denver. This husband/wife duo did all the work and just paid for the rent of the land (they even brought their own water). They sold their produce at the local farmer’s market. They were so successful with it that now, nearly 8 years later, they have their own farmland outside of Kiowa. They are a self-sufficient farm and use no fossil fuels in their operation (they use draft animals for tilling). They also have a side operation converting used cooking oil into fuel–which they use for powering their delivery truck (they have a produce delivery service for the metro area). It’s an incredible operation–if somewhat bizarre due to their unusual philosophy of farming. Google Coastal Fields to find their website. Roxanne–that is a great story–thanks for the heads up on those folks! I will definitely look them up!